Have you ever been to a Brazilian steakhouse? No? Well, let us paint this picture for you. You walk into a very classy restaurant and are immediately hit with the mixing aromas of perfectly seasoned meats. Chicken, pork, steaks, lamb - they all come together to make this irresistible scent. You're escorted to a table, but you notice something weird. The waiters aren't carrying around plates of food. They're carrying skewers of appetizing meat. Those scents waft past you and you suddenly realize that this must be what heaven is like. That's a Brazilian steakhouse. It's like an all-you-can-eat buffet that you never have to leave the table for. Just like a buffet, you don't have to worry about the delicious train of food ever stopping. It keeps coming until you throw in the towel. You aren't charged extra for each slice of meat. 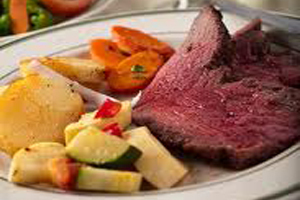 Unless you order an entree or a salad at the table, there's one flat fee for the Brazilian-style service. 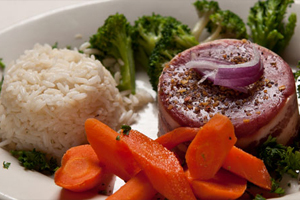 At Yolie's Brazilian Steakhouse, this is exactly what you have to look forward to. A never-ending stream of expertly cooked meats, marinated in herbs native to Brazil and grilled to that golden brown crisp. Our mouths are watering just thinking about it. When you take your seat at Yolie's, the meats that are served rodizio-style, or brought to you on a skewer, include turkey wrapped bacon, young spring chicken, homemade sausage, tri-tip beef, top sirloin, a pork tenderloin, and leg of baby lamb. These meats are as tender as meat can get and the flavors just drip off of them with every bite. The grilling method leaves an appetizing crisp on the outside, where the flavor is even more predominant. If you're not looking for a continuous stream of meat, you do have some options. House specialties can be ordered separately at their own price. Dishes like chicken angelo, a chicken breast and artichoke hearts sautéed in olive oil, a vegetarian platter of steamed vegetables, shrimp scampi, pork chops, filet mignon, porterhouse, ravioli, and beef stroganoff offer flavorful alternatives to the house's specialty of skewered meat. With your entree, you get the choice of a fresh garden salad or black bean soup, with sides like house potatoes, polenta, and farofa and rice adding a compliment to your meal. If you think your stomach can handle a little dessert, Yolie's chefs have cooked up some deliciously decadent dishes to pile onto your mountain of meat. These sweet morsels will top your meal off perfectly. Chocolate mousse cake, flan, tiramisu, creme brulee, assorted ice cream, and a selection of cheesecakes tempt what's left of your appetite with their inevitable deliciousness. Unless your stomach is about to burst, don't try to fight the temptation. You'll be ordering a dessert for sure once you see these morsels. At Yolie's it's all about indulgence. You will probably over indulge, but it's expected when you're given nothing but seemingly endless strings of meat, served right to your table. We just don't recommend trying one of the Stratosphere's thrill rides afterwards. It may get messy.